With our head office in Canberra and a team to look after you, we will make the booking process simple. We manage over 70,000 candidates every year, so from the start of your booking to the receipt of your certificate and card, we will look after you. We take the guess work out for you, by using only the best ALS instructors in the industry. Our instructors provide you with an excellent educational experience. Our highly qualified team of doctors, nurses and paramedic ALS Instructors have many years of experience and are fully approved ALS instructors registered by the Australian Resuscitation Council. The course provides a recognised Australian Resuscitation Council courses with 4 years certification and is accepted in the UK and Europe. Certification is also valid in New Zealand with the NZRC. 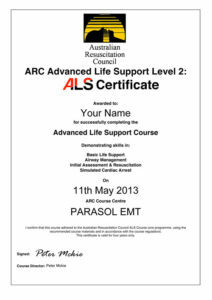 Our Advanced Life Support courses are accredited and certificates issued by the Australian Resuscitation Council (ARC). The ARC course completion cards are the Gold Standard and are universally accepted by all employers. You can check to see if the provider is ARC accredited on the ARC website.